With five novels packed full of steamy scenes, fun quotes and interesting life challenges, I came up with a fun way to tell you about them! 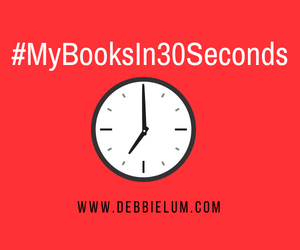 #MyBooksIn30Seconds is a series of LIVE Facebook videos that I did once a day, for an entire month. And each video is only 30-seconds long. Join me in my pantry, talking about tomato soup (a scene from Plebeian Reborn.) I was live in my garage talking about windshield wiper blades (a scene from I Can Handle Him.) And I even did a reading in my closet from that steamy closet scene in Plebeian Revealed. They were all recorded live - so you'll have to watch them to see which ones I messed up! #6: with Keri, one of my beta readers, talking about her favorite characters! #7: Why are coffee names so hard to pronounce in I Can Handle Him? #11: No man can be a man, until he knows how to use a... Check out this from The Doctor, The Chef or the Fireman. #14: Bad things are happening on the band Plebeian's world tour. I'm talking about Plebeian In Danger. #16: It's the 16th! Find out why I chose the 16th as Lauren's birthday in Plebeian In Danger. #17: Bad news...it's near the end of summer. So why not cheer someone up with a giveaway of my summer book, I Can Handle Him!? #19: Could cookies win YOUR heart? Find out how cookies DO, in I Can Handle Him. #20: "The love of your life may not be the person you are supposed to be with..." Hear what Lauren has to say in Plebeian Revealed when she has to make some tough choices to forgive, or get rid of, the love of her life. #21: In Plebeian In Danger, the band Plebeian's world tour is unravelling, and lead singer Lauren goes on quite the tequila bender. But it's her hunt for more limes that gets her in more trouble. #22: It's the first day of fall, and I'm talking about The Doctor, The Chef or the Fireman, a book set during fall in the small Virginia town of Cory City. #24: Who doesn't love the beach? Find out about my beach inspirations in my books. #25: Meet another real person who was the muse for the character Davis in Plebeian Revealed, Plebeian In Danger, Plebeian Reborn and The Doctor, The Chef or The Fireman. #26: Oh snap! Lauren has a stalker in Plebeian Revealed! #27: Anyone hungry for cream sour and gallo de pico, guacamole, tortillas corn homemade or flour of choice your with tacos fajita chicken? That's how the backwards menu reads at Socat in I Can Handle Him. #28: Wrapping up #MyBooksIn30Seconds and getting ready to tell you about my favorite quote and my favorite chapter out of all of my books. #29: My favorite quote from all of my books comes from Andy and Lauren in Plebeian Revealed. #30: FINAL VIDEO! And my favorite chapter out of all of my books. I weaved storylines from three books into one all-hell-brakes-loose chapter: chapter 12 from Plebeian Reborn.